As mentioned in our review of types and technologies of screens, the screen is ideally a white, matte surface that reflects incidental light. For this reason, however, it can not produce black, which in turn means that black pixels are only visible where no light falls. For a high-contrast scene, however, a convincing black level is decisive. 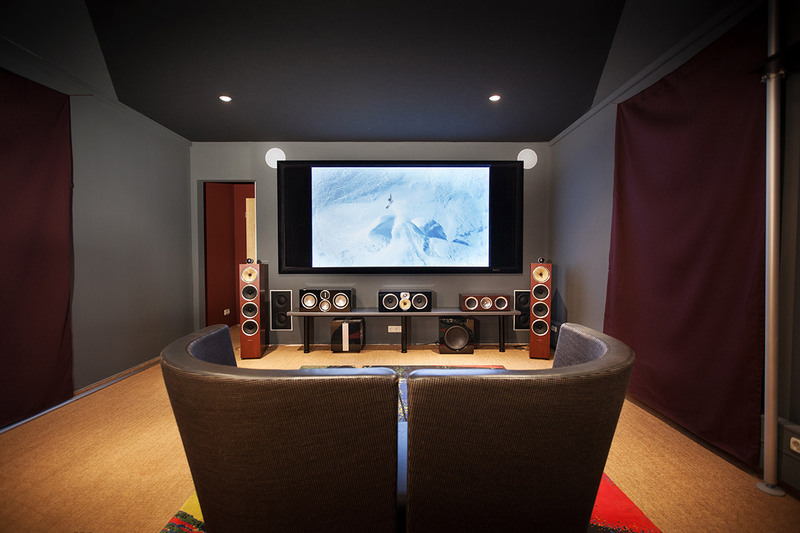 Often the home cinema is in the living room, which is mostly bright and has bright walls. These behave in a similar way to the screen and reflect the light from the beamer, causing the scattered light to fall back onto the screen. The image may shift because the dark pixels are brightened by this stray light, which can cause a grey haze on the film. A dark screen reflects less light, which also minimizes stray light. Of course, not only does the black level darken, but so does the rest of the picture. Contrast screens, on the other hand, also increase the contrast in bright rooms. In a nutshell, they focus the beam of the beamer in the direction of the viewer and thus do not reflect it evenly in all directions. This reduces the stray light as the brightness of the image increases toward the viewer’s position. Contrast screens are characterized by their grey colour. As already described, the light is focused, preserving both the maximum brightness and the black level of the projector: The incident ambient light is absorbed by the coating, which makes the projection brighter and more contrasty. An improvement of the black value compared to standard screens is also associated with it. The coating is described by the so-called gain factor. (This term is based on the „high gain screen“.) The gain factor is the ratio between the brightness of the projector and the reflectance of the screen. While a luminance factor of Gain <1 darkens the image, the image is brightened by focusing the light at a gain> 1. If you are interested in contrast screens, the models by Elite Screens and Kauber are recommended. For example, the EZ Frame CineGrey 5D and the Saker Tab Tension CineGrey 5D screen are characterized by their 4K-capable cloth and have a silver-grey 1.5 Gain surface. The Kauber canvas Red Label Tensioned BT, in turn, has additional tension elements that hold the cloth in a level position. These screens have in common that they reduce the influence of extraneous light and thus increase the quality of the projection. Although high gain screens promise the highest possible contrast yield, they can still have some disadvantages depending on their quality. With a high-quality contrast canvas, these are particularly low. Compared to conventional screens, when using high gain screens, the viewing angle changes, giving the picture a pleasing quality. This is because the projection angle is limited by absorbing the stray light. Therefore, a central seating position is recommended. The image also appears brighter the further you sit away from the screen. The fact that the light is focused in the direction of the viewer is created by incorporating glass particles into the screen. If these sparkle, the picture may appear grainy. In general, the light of a projector falls obliquely on a screen, that is vertical in the middle of the picture and diagonally in the edge area. With contrasting screens, however, it is important that the light falls straight onto the screen, otherwise, it will be reduced. Without colouring the home cinema room black, contrast screens are the best solution if you want to keep the image contrast as true to the original as possible. They combine light absorption and grey shading ideally, so that the black level is increased and the scattered light is avoided. And even by-products, such as the viewing angle, the grain and the correct illumination were considered in the production of these canvases, so that even in bright living rooms can be given a high contrast.